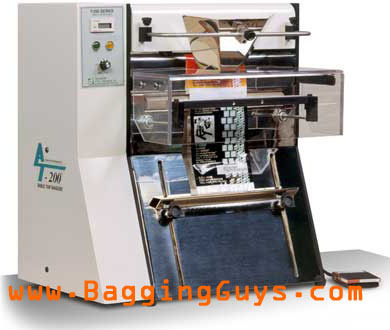 The T-200 makes it easy to open, load / fill and seal pre-formed, pre-opened bags on a roll. It will allow you to achieve MUCH HIGHER packaging rates than you get with pre-cut bags and an impulse sealer! By using our Pre-Opened Bags on Rolls, instead of loose bags, simply pull the bag into the loading and sealing position and the bag blows open! Now insert the product and press a foot-switch or guard-switch (guard tilts downward cycling the bagger) to seal the bag. Its just that simple, and quick! If you need to print information on your bags, the T-375 Printer/Bagger includes the ability to AUTOMATICALLY PRINT each bag just prior to opening it! Click here for details about the T-375 Printer/Bagger. Our most economical Tabletop Roll Bagger! Call Us for Access to a T-200 Video!